Sister Mary Elizabeth Keyser died on July 24, 2018 at the Maryknoll Sisters Center in Maryknoll, NY. She was 98 years old and had been a Maryknoll Sister for 80 years. Mary Elizabeth was born in Philadelphia on May 3, 1920 to Della (Haney) Keyser and Henry Nelson Keyser. She is survived by her brother, Nelson Keyser, and her niece, Mrs. Mary Jane Robinson. In 1937, Mary Elizabeth graduated from West Philadelphia Catholic Girls High School. She entered the Maryknoll Sisters Novitiate in Maryknoll, NY on December 7 of that same year, coming from St. Matthias Parish in Bala Cynwyd. At her reception she received her religious name, Sister Anne Virginia. She made her first profession of vows on June 30, 1940 and her final profession of vows on the same day in 1943, both at the Maryknoll Sisters Center. After making her final vows, Sister Mary Elizabeth was assigned to San Juan Bautista, CA where she did catechetical work for four years. In 1957, she was assigned to Bethany House (Maryknoll Sisters Nursing Home) in Ossining, NY where she provided aid to elderly sisters and often assisted with transportation needs for two years. In 1949, Sister Mary Elizabeth received her first overseas mission assignment to Bolivia, South America. Upon her arrival, she studied the Spanish language and then served as principal of the Maryknoll Sisters Schools in both Cochabamba and Riberalta until 1956. 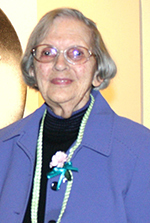 Sister Mary Elizabeth returned to the Maryknoll Sisters Center in 1958 for congregational service in the development department, doing promotion in the Midwest. In 1959, she was assigned to Chile, where she served as the executive secretary and supervisor of catechetics, establishing programs for the Instituto de Catequesis Latino American (ICLA). In addition, she served as the directress of the Carmelite House of Prayer in Santiago and as the coordinator of the Maryknoll Sisters House in the Chile region until 1992. In 1992, Sister Mary Elizabeth was assigned to Monrovia, CA where she worked as a volunteer in religious education in the Immaculate Conception Parish and served as the RCIA director of Hispanics for the parish from 1998-2001. She also spent a considerable amount of time doing volunteer work by writing letters to women in prison. In 2004, Sister Mary Elizabeth returned to New York to retire at the Maryknoll Sisters Center, where she remained until her death. A Vespers service was held for Sister Mary Elizabeth on Thursday, July 26 at the Maryknoll Sisters Center, followed by a funeral Mass on Friday, July 2. Burial took place at the Maryknoll Sisters Cemetery.